I’ve just finished reading a story for the Toasted Cake podcast. Here’s a direct link to the audio. Great, great fun. Much as I love performing my own work, there’s something especially intriguing in reading stories written by others. This week for Toasted Cake, I read “Green Future” by Deborah Walker, set in a future London overtaken by rampant flora and microfauna — algae adhering to every surface, changing everything it touches. Not only is there some great urban decay imagery, but the story itself explores what it would mean to be changed oneself by such a change, what it means to embrace things, to cling to things, to let things go. 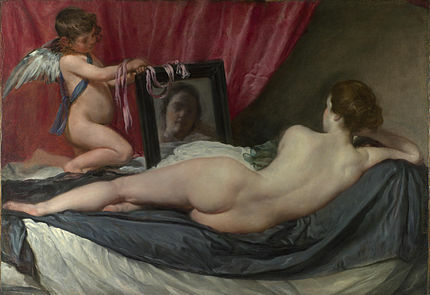 Diego Velázquez’s Rokeby Venus (famously slashed as protest by suffragette Mary Richardson in 1914) features prominently in the story. It’s a wonderful choice on Walker’s part, as this particular Venus so saturates the public consciousness, the dialogue about art, fine art, and what it means culturally, that she’s been rendered and re-rendered: as Snow White; as a Fat Ginger Cat; as a tattooed goddess; as a… whatever these are. Lovely irreverent reverence. An homage made while blowing raspberries. Now I want one in algae, please — or, playing into my own eco-fascinations, lichen. Bonus Track: my urban decay board on Pinterest.